Roadmaps are sometimes hard to read. But you can be sure that they’re always much harder to create. 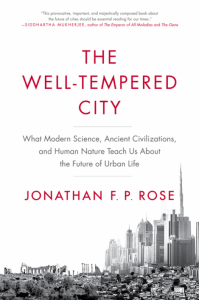 I kept that thought in mind during my enjoyable read through a new and important book, “The Well-Tempered City: What Modern Science, Ancient Civilizations, and Human Nature Teach Us About the Future of Urban Life”, by Jonathan F. P. Rose. It does a superb job for city-focused readers like me. Rose provides much more than just a list of the elements needed for any city to become both a ‘smart-city’ and a ‘just-city’. His book provides something of far greater value: the map itself. This differentiates “The Well-Tempered City” from the multiple city-of-the-future titles flooding the book market. It helps to define this book’s “difference that makes a difference”. Rose avoids giving mere lip service to powerful forces at work inside our cities, but he starts by truly getting to the core of these trends: democratization and citizen engagement; inclusion at both the social and economic levels. From a stage in Alpbach, Austria during the European Forum Alpbach 2016, Rose said that “only by seeing the whole can we heal the whole.” Rose argues that the emergence of a whole-systems approach— informed by up-to-date research on brain science and human behavior – is an approach which sees the whole city greater than sum of the parts. But, you’ll want to ask, ‘exactly how do the pieces fit together?’ This is where “The Well-Tempered City” shows its true colors. Rose offers critical guidance which city leaders need, whether a public sector leader (an elected or appointed), a private sector leader, or an independent sector leader (in NGOs, academia, etc.). Rose leaves out the extraordinary story of his company and the pioneering work with affordable housing upgrades, and the parallel upgrading of the surrounding urban systems and urban services. Readers will want to do some research and read this extraordinary investment track record; you’ll find it a worthwhile story to review. Readers will understand better how Rose’s principles work themselves out in the real world where a profit-centered organization innovates within the constraints of low-income housing. Some of Rose’s big insights are drawn from the latest science research. One of these could be quite important for our cities: Affordable housing in essential, but it’s certainly not sufficient to make a sustainable and nurturing community. Public housing is a living lab, and it’s been such since the days of Charles Abrams and his “City as Frontier”. Rose’s aim here is not to equalize every human being, but to equalize all opportunities. He sees the city, and most especially the housing in each city, as a system situated at the crux of that challenge. Where Rose is going with this is something he calls “communities of opportunity”. As he defines and develops the concept, this is a new way of framing the conversation. Rose is focused on those citizens who, all too often, are situated outside the mainstream of urban opportunities. Rose is anxious to emphasize something else drawn from science that we readily forget: Nature has an amazing restorative capacity, and urban ecosystems are no exception. Thus, Rose shows the importance of getting out of the way in cities, such that biodiversity can flourish. 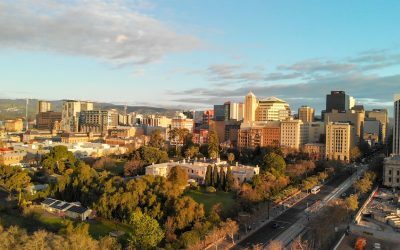 Actions informed by a whole-systems approach are making it possible for city ecosystems to recover from the damage done since the Industrial Revolution. Some pioneers are actually making high-margin investments in our inner cities, enhancing economic return while reducing environmental impacts. Doing the right thing makes more economic sense. Believe it or not, as Rose shows in a dozen different ways, optimizing urban systems makes it possible to optimize shareholder value. Buildings actually have positive economic benefits, especially when you consider the building’s ability to capture rainwater for toilets, returning water to the ecosystem after cleaning within the building, etc. Rethinking the city’s ‘linear infrastructure’ comes when you consider the full systems which comprise a city’s metabolics. In a linear city, 98% of the resources which come into the city leave it as waste within 6 months. In a circular city that doesn’t happen. Regenerative systems go well beyond current urban resource–recovery systems, including recycling services of the type that San Francisco provides to (and with) her citizens. In this regard, please be sure to read through to two of Rose’s outstanding examples: the State of Virginia’s solid waste policies and Windhoek’s story of extreme wastewater. Rose puts to rest the power of linear while giving circular its rightful place at the center of our decisions. There’s some very good news embedded inside this book: Replicating the magnificence of nature is not impossible, as Rose’s examples show us. By tying it back to the ‘cities of opportunity’ Rose enables us to drill down into each of the elements and reversing the isolation of people, families and income groups. By calling for an infusion of compassion into our urban-development agenda, Rose reminds us that the output we get from our society is a true reflection of the shared values which we infuse into the city. Be forewarned: Our mental maps are not accustomed to applying the abstractions of systems dynamics to the mundanities associated with affordable urban housing investments. Inside this book you’ll find some compelling symbol of human aspiration, and one of those offered by Rose is J.S. Bach, especially his truly amazing Well-Tempered Clavier. In that spirit, Rose’s urban-development business thinks that its core goal is realizing the full potential for humans, believe it or not.